Benefits in Britain: Has it been beneficial? Jobs these days are very hard to obtain. But who do we blame for this? or better yet, how could we improve on this? This issue has been raised on numerous occasions by politicians and job agencies, but with shows airing weekly such as: ‘Benefit street’ on channel 4 and ‘Benefits and proud’ on Channel 5. This controversy of programmes had definitely sprung up many complaints regarding whether the content of the show conveyed a negative approach of our society or shed some serious light of our broken-down economy. Questions from many viewers and also MP’s have been asking as to how can the seventh richest country still be struggling? It doesn’t seem to add up. 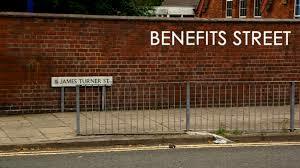 Benefit street was a show that focused on local residents living on James turner street in Birmingham also known as ‘Benefit street’ since a massive 80% of people are claiming benefits. We focus on characters like ‘White Dee’ a mother of two and ‘mother hen’of the street talks about how she would love to work and that due to her condition it isn’t possible. But many of us who aren’t employed, are generally struggling to find a decent paid job. Katie Hopkins, apprentice star appeared on the ‘big benefit row’ sent out a message to the Residents of James turner street to ‘get a grip’ and moaned that she hated seeing people at home whilst she’s out working for her hard-earned money. MP’s Chris Bryant and Mike Penning also featured on the show by expressing their views on benefits and jobs out in England, Making valid pints on how most people who are on benefits tend to abuse the system and not make any effort into finding a job. Referring to Mark and Becky also from Benefit street. But this is only half of what was needed to be addressed with the show only lasting 45 mins a week and the live shows for an hour, is it definite that be will be seeing a ‘New Britain’ anytime soon?